Stuttering as an Impediment to Driving? Just when I thought I had seen all the crazy examples of how misunderstood stuttering is, something more outrageous has come along! Recently, upon the request of his employer, a young adult who stutters went to get a Tanker endorsement added to his commercial driver’s license, which requires a written exam. When he spoke with the Department of Motor Vehicles (DMV) clerk, she informed him his name had been “flagged,” and that he could not take the exam. She told him that someone with the DMV had observed extraneous movements when he spoke, and there was concern over whether he was “fit to drive.” He tried to explain that he stutters and the observed movements were simply voluntary movements he sometimes uses to help himself get a word out when he is stuck. Not only was he NOT allowed to take the written exam for the endorsement, he was told he would now have to re-take his driver’s test! Hoping it would resolve the issue, he took off another afternoon of work to re-take his driver’s test. After passing the road test, he was still inhibited from taking the written exam required for the Tanker endorsement, and told by the DMV that he must first obtain a letter from his doctor declaring that he is fit to drive. At this point, he sought help from me, his speech pathologist. I wrote two letters. 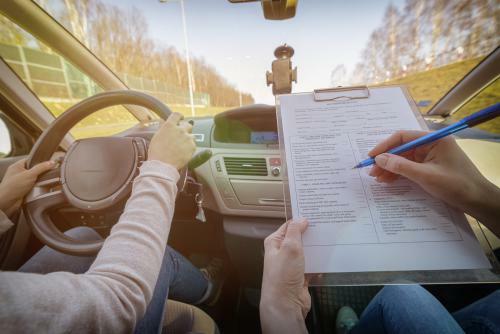 The first explained the secondary behaviors associated with stuttering, and stated that these voluntary movements do not impact someone’s ability to drive. The second letter quoted and explained the Americans with Disabilities Act (ADA), making the argument that denying the individual the chance to gain his Tanker endorsement would be a violation of his civil rights. I then requested several packets of information on stuttering from the Stuttering Foundation and sent them to the DMV along with my letters. I am happy to say that the delivery of the two letters, SFA information packets, and a not-so-subtle message to the head of the DMV effectively resolved the issue. We stated that since a violation of civil rights was evident, the lack of a resolution would necessitate contacting the media and organizations that defend the civil rights of U.S. citizens. With this article, we hope to share this experience with others who stutter.